aye, caramba. 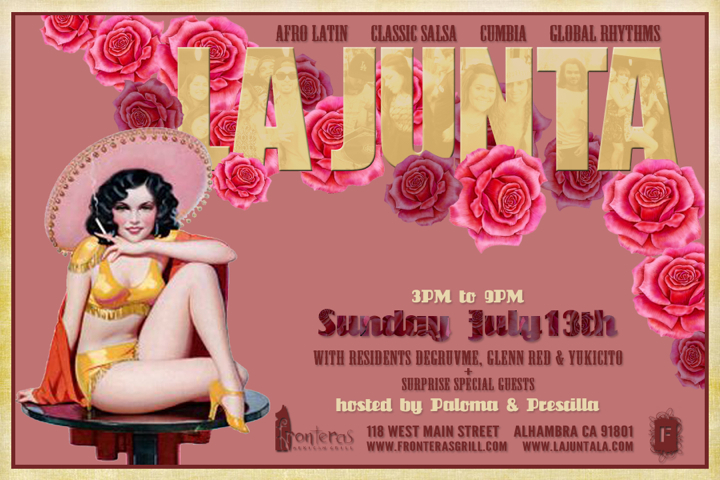 | GLENN RED L.A.
Here’s my latest flier design for the LA JUNTA party happening on SUNDAY JULY 13 in Alhambra CA, just east of Los Angeles proper. We’ve had two amazing Sunday events this summer and we’re ready for the heat of July with our own hot music and cool people. Event details are below. Please come through if you’re in the LA area! The LA JUNTA Summer Season rolls into July on the heels of two fantastic gatherings in June! Those in attendance so far have been treated to live Colombian music by LA MISA NEGRA, amazing guest deejay sets by NYC’s NAPPY G (Turntables on the Hudson) and LA’s DANNY MASSURE (Spring Strut Recordings)…with all this icing atop tasty sets by La Junta residents YUKICITO, GLENN RED & DEGRUVME! After a few weekends off, we’re back at it on SUNDAY JULY 13th at FRONTERAS MEXICAN GRILL & CANTINA with some surprise guest performers. We’ll be knee deep in good music, good food and happy hour drinks, so round up your party fam and get ready to dance, smile, laugh and hug a Sunday afternoon away! ← now that’s a fly-er.